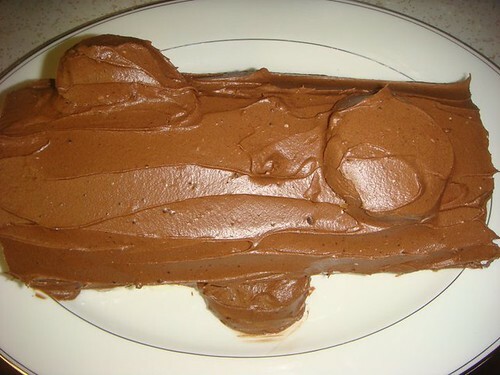 I wanted to share one of my very favorite holiday recipes. 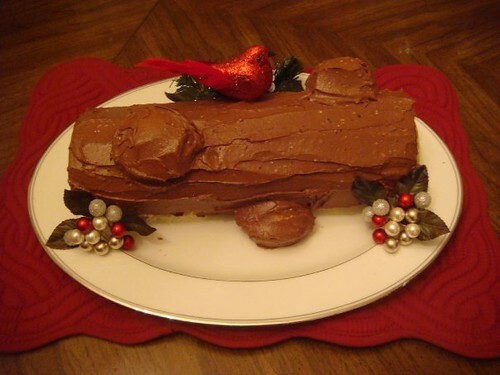 This is the French 'Yule log' cake that I make every year...la buche de noel! I got this recipe when I was in eleventh grade or so, and I have made it just about every year since for my family. This cake is not for the faint of heart...it is a bit labor intensive. Having a KitchenAid for the past couple years REALLY helped with the 'beat for five minutes' instructions! Preheat an oven to 375 degrees F, Butter or grease a jelly-roll pan. Press an approximately 16x12 inch sheet of waxed paper into the pan with your fingers. Remove the paper, turn it over, and place it back into the pan, pressing it into place, to grease both sides. With scissors, trim off any excess paper. Butter, grease, or line two 2-inch center cups of a muffin tin. Set aside. To make the cake, in a large bowl, using the electric mixer set on high speed, beat the eggs until thick and lemony, about 5 minutes. Add the sugar and continue to beat on high for 5 minutes. On low speed, beat the water and vanilla. Sift together the cake flour, baking powder, and salt into the batter, and beat until just combined. Spoon 2 to 3 tablespoons batter into each cupcake cup. Pour the remaining batter into the prepared baking pan. Tilt the pan to evenly spread the batter. Place the baking pan in the oven and bake until the cake springs back when lightly touched and just begins to turn golden (about 10 minutes). Bake the cupcakes until they just begin to turn golden, about 10-12 minutes. Let the cake and cupcakes cool on a wire rack for five minutes. Lay a clean kitchen towel on a countertop. Sift confectioners’ sugar over the towel. Invert the cake onto the towel and peel off the paper. Beginning at the long side, roll up the cake with the towel. Refrigerate the cake roll for 30 minutes. To make the filling, in a bowl using the electric mixer set on medium-high speed, beat the cream until it begins to thicken. Add the vanilla and confectioners’ sugar and continue to beat until firm peaks form and the mixture is spreadable. To assemble, remove the cake from the refrigerator and unroll it on a counter. Spread the filling on top within 1 inch of the edges. Beginning at the long side, carefully roll up the cake, removing the towel. Place cake on top of two dollops of frosting to hold to platter. Ice the cake. You can use the cupcakes as branches or bumps on the log. Decorate with chocolate leaves, animals, holly sprigs, etc to give the cake a “woodsy” or “log” look.